The mission of City of Lakes AmeriCorps is to help students build the academic language skills needed to advocate for themselves and be able to use education as a means to reach their goals. Our mission for members is to build a learning community through service, reflection and inquiry. As a partnership between Minneapolis Community Education and the Multilingual Department, CoL strives to support the education and development of LTELs in Minneapolis Public Schools. This program is made possible by CNCS and ServeMinnesota. AmeriCorps is a national network of hundreds of programs that engage over 75,000 people in service across the nation. Learn more about AmeriCorps programs here. Applications are now open for our 2019-20 program year! If you are considering a year of service, check out our Become a Member section to learn more. Why did you decide to serve with CoL? I decided to serve with CoL because I am considering a career in teaching someday. CoL seemed like (and has been!) a good way to discern if I want to teach or not. I also decided to serve so that I could experience living and working in an urban context, being I grew up in the Northwest suburbs of Minneapolis. What have been the most surprising challenge of your service so far? The most surprising challenge has been to separate my students' daily success from my own as a coach. There are some days where, no matter what I do, a student isn't ready to engage in class. It's easy to leave defeated when a student is unresponsive like that throughout a school day, but I've found that a really good day with the same student can be, and usually is, hiding right behind the corner. What do you plan to do after your year of service? After CoL, I want to travel overseas to teach ESL; I am currently enrolled in a Teaching English as a Foreign Language certificate program. 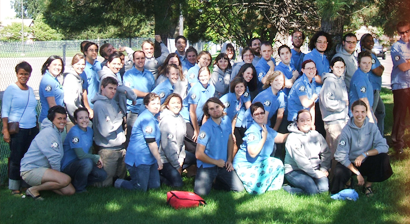 Click here to read more profiles of AmeriCorps members currently serving in CoL! Follow City of Lakes AmeriCorps on Facebook and Twitter!